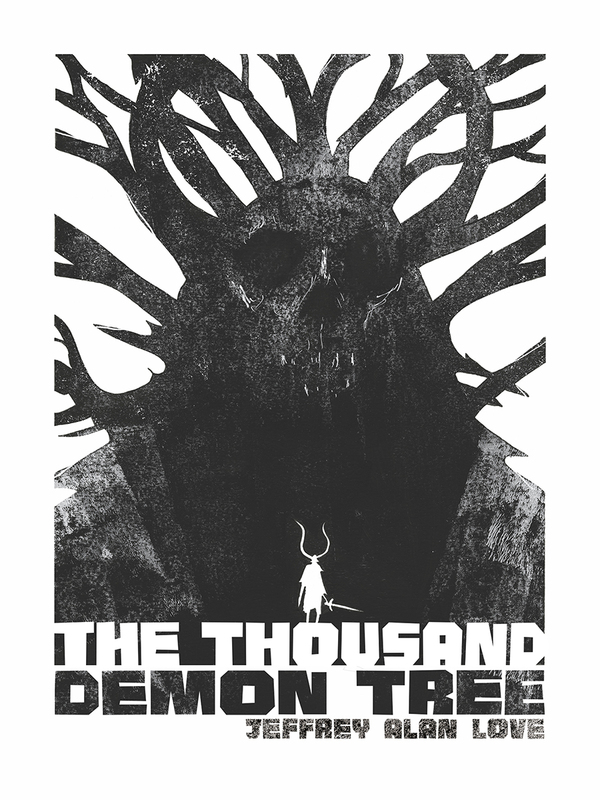 "Jeffrey Alan Love's The Thousand Demon Tree is absolutely stunning. It's a wordless graphic novel. Each image, each page, each spread speaks volumes, from the faintest whisper to a deafening roar. It's Magical. I've been reading and re-reading it and I cannot get enough. It's one of those rare pieces of art that somehow feels like it has always been there, inside all of us, waiting to be experienced. It's that primal, that universal. This is one for the ages." "A graphic narrative in its purest form; strong images, visual rhythms, shapes, marks, a sense of motion close to animation, creating a timeless fable." "Jeffrey Alan Love is a genius of stark black and white and the power of silence. The Thousand Demon Tree is the best kind of epic, one with action, atmosphere, monsters, a world mythos, and plenty of room for the reader to dream into it." "Jeffrey Alan Love is one of the best artists out there - gritty, striking, and always original." "Wonder how sequential art would have looked if Ingmar Bergman had made comics instead of film? Jeffrey Alan Love's The Thousand Demon Tree is the answer." "In Notes from the Shadowed City, Jeffrey Alan Love presented the reader with a myriad of haunting moments, each contributing to the sense of an over-arching history. With The Thousand Demon Tree we experience one such moment, extrapolated and expanded to an epic scale, no less enigmatic but now with dynamic, cinematic scope. Love is an inky David Lean, no less!" "Two quick takes regarding The Thousand Demon Tree: 1) Jeffrey Alan Love is one hell of a storyteller. He's created a rich, emotional, totally immersive epic composed completely of imagery, and 2) any serious student of design would do well to pay attention. I know I am!" "The Thousand Demon Tree is incredible. What Jeffrey Alan Love has done with this book is firmly cement himself as one of the most important artists making ominous and fantastical narrative work today. Full of shadows and terror and razor sharp edges, this gorgeous book will sweep people into its dark and paralyzing world." "Much has been said of Love's art. It is by turns haunting and elegiac. His storytelling is masterful as well. The Thousand Demon Tree is more of an experience than a read - it's dreamlike, yet gritty and profound. It's mournful, yet cyclical. A study of mortality in a limited palette, with stark yet archetypal figures moving with great purpose. Love's work takes an honored place on my walls, and on my shelf." "Who needs a thousand words when a picture can tell the same story? And Jeffrey's pictures do that and more. This is another ambitious, beautiful and engrossing book that sweeps you up in its bold, inky world." "Jeffrey Alan Love's The Thousand Demon Tree is breathtaking in its simplicity and power. Immersed in the silent narrative is like taking part in the most vivid, and disturbing of nightmares - but in a good way! A book that I'll certainly go back to again." "Once again Jeffrey Alan Love demonstrates his mastery and complete grip of the imagery of the quest. The cinematic sense of the extended journey and its loneliness is very witty and effective. I love the fact that the story is silent, a song without words."